Dadz, Kidz and some Grandadz feeding the chickens at The Glebe, next to St Andrew's Church, in April 2013. 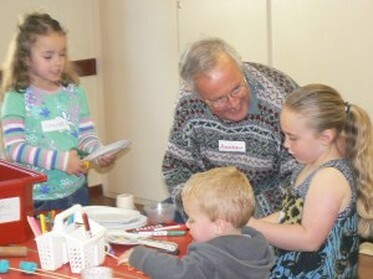 ​"Dadz and Kidz" is a regular community event which is now in its seventh year. a Christmas party with fun, food and games. Imagine the smell of bacon and sausages cooking, a dad sprawled on the floor playing with his son and some toy zoo animals. Another is sitting on a sofa reading the paper. A third dad is rolling out some Play Dough for his daughters. A dolly is being pushed around in a toy push chair while the child`s father is chatting to a helper. Puzzles are keeping three toddlers engaged. People are having fun but`s it`s all very relaxed! 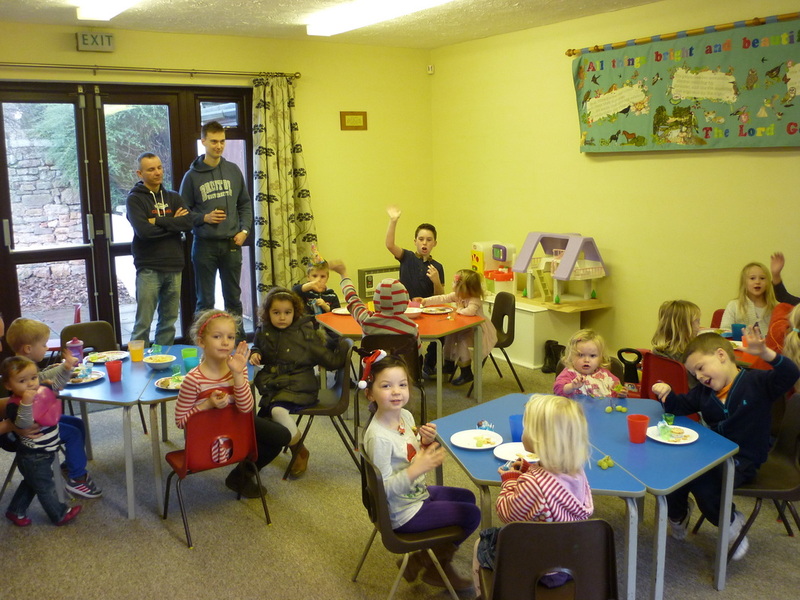 The idea was to give dads quality time away from home with their young children for a few hours on a Saturday morning in a pleasant environment - and to give mums a few hours` peace too! 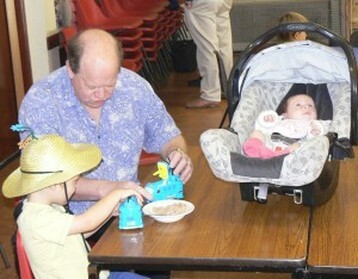 A sort of toddler group for men, but without too much singing! Sessions run from 9am to 11.30am on the third Saturday of most months. 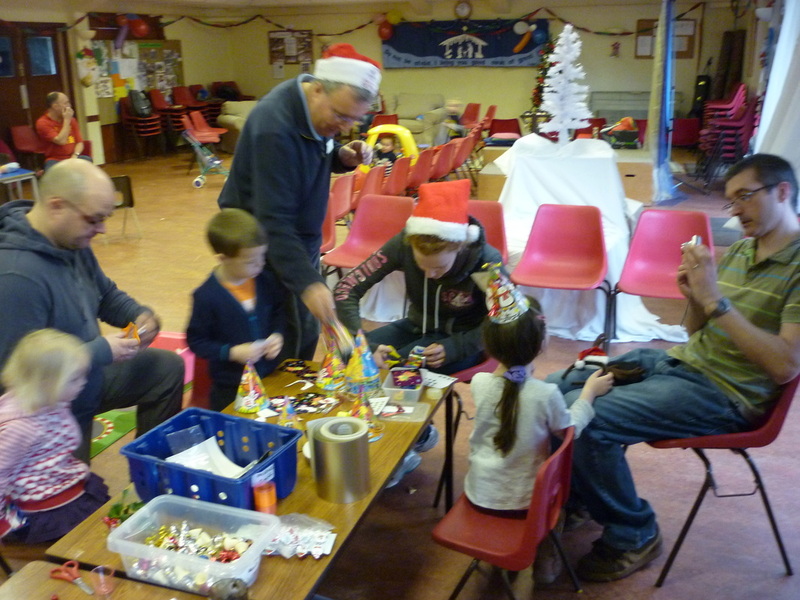 Dadz and Kidz happens at St Andrew`s Church Centre. All are welcome and we are especially pleased when Grandadz come along. Dadz and Kidz sessions have proved popular, have featured in the local press, are advertised locally, and this is our sixth successful year. There`s no charge but donations have kept us in the “black”! It`s fine to stay for the whole session or just call in for part of it. 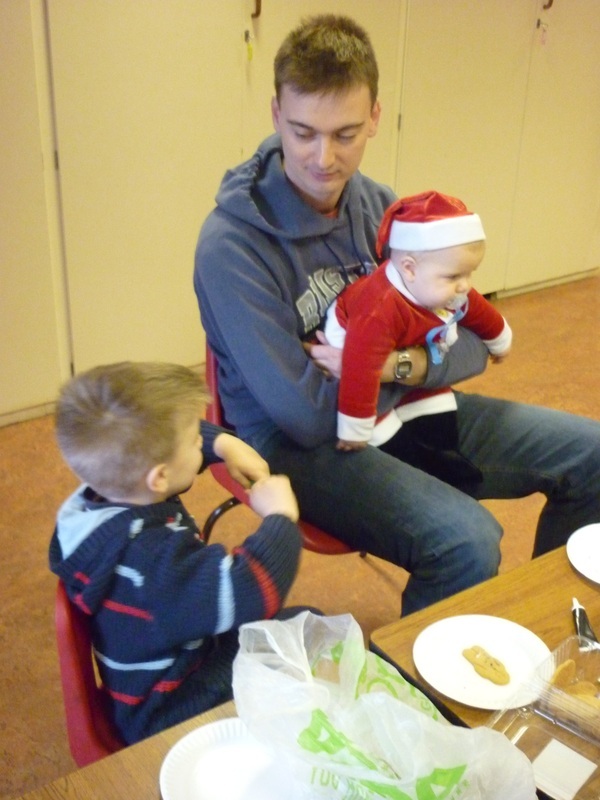 The morning includes opportunities to meet other dads in a relaxed setting, to eat breakfast (cereals, bacon rolls or sausage baps, toast, tea, coffee, juice etc), to browse through the newspapers, to play with some different toys and to take part in a game or a simple craft activity. We have had some singing, we have had races outside and we have played the parachute game when the weather allows! Often one of the helpers shares something about his faith, delivers a Thought for the Day and requests can be made for prayer. We`d love to see you there. Why not give us a try? Please phone Rob Johnson on 798330 for more details. Future dates will be posted here, once they have been confirmed, and also in the St. Andrew’s Events Calendar.